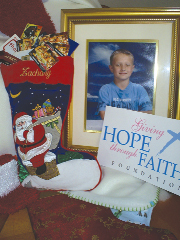 Stockings of Hope was started in memory of Zachary Tucker, who lost his battle to brain cancer in 2006 at the age of 8. More than 240 have received assistance through this project since it began. More than 240 families have received their assistance since this foundation first started, and the referrals continue to pour in. By providing assistance of at least $100 in gift cards and messages of hope once a month for a year, they are able to shine a light and bring some smiles to a very difficult journey that can be filled with fear, desperation and uncertainty. They also work hard to be good stewards of the funds we receive by operating on a volunteer basis only. Ninety two cents of every dollar received goes out to the families they assist. To learn more about the foundation or the Stockings of Hope project, go to www.givinghopethroughfaith.org or contact Tucker at 685-6773.